by Dr. Douglas Graham can change your life. If you want to heal, return to the level of energy you knew as a child, and get a new lease on life, I cannot recommend this book highly enough. The philosophy of health presented in these pages is the same one you'll find on this site, and the reason is because it works. I suffered from colitis of an ever-worsening nature for eight years before I discovered a pamphlet by Dr. Graham, "Grain Damage". The idea of a fruit-based diet he presented was alien to me at the time, though it seems the most natural thing in the world now. When I finally decided to give a raw food diet a shot, I was amazed at the difference. Within a month most of my colitis symptoms were gone and I was experiencing increase energy and improved overall health. My weight dropped, and a few years later I was so changed that I was able to run a marathon. It seems like my mind keeps getting sharper while my body grows stronger. I never get sick any more, my headaches are gone, and I feel happier. The idea is simple: eat a low fat diet based around raw fruit but also containing plenty of leafy green vegetables. Eating so much fruit may seem odd at first, but you'll soon realize it's far more natural and satisfying than any diet you've followed. Whether you're a SAD eater, a cooked food vegan, a high fat raw foodist, or something in between, Dr. Graham does an excellent job of explaining the pitfalls of those diets. Meat, grains, and the process of cooking all seem normal in the context of our lives, but they all throw a wrench in our health. Perhaps the greatest strength of this book is that it responds to all those nagging doubts you have in the back of your mind. But don't we need meat? Isn't that too much fruit? But I have diabetes, what about all the sugar? Is 10 percent of calories enough fat? What exactly can I eat on this diet? Are garlic and onions good? How do I get off salt and other toxic foods? It's stocked with sample menus, testimonials, and a great question and answer section in the back. This book really isn't so much of a diet as a complete lifestyle; the natural lifestyle of health that's our birthright. If you're looking for a binge diet to go on for two weeks then you're probably looking in the wrong place, But if you want true health, energy, and a fit body, I can't recommend a better book. 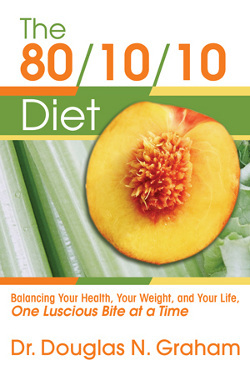 Get the 80 10 10 Diet Here. to send you The Raw Food Health Journal.